5 Working for China-US "friendship"
Koji Ariyoshi (1912 - 1976) was an Hawaii activist. Koji Ariyoshi was born on a coffee plantation in Kona. Already interested in Communist ideas at the University of Hawaii, Ariyoshi won a scholarship to the University of Georgia in the 1930s. In Georgia, Ariyoshi lived with the leftist parents of Communist sympathizer and Tobacco Road novelist, Erskine Caldwell. Because he was in the mainland at the outbreak of WWII, he was interned at Manzinar relocation camp, where he enlisted in the Army and was assigned to Yenan China as an interpreter and U.S. military observer. Ariyoshi joined the WW2-era Military Intelligence Service/OSS—predecessor to the CIA—and used his language skills to land himself a position as U.S. military liaison to Communist forces in China—working personally with Mao Zedong. Ariyoshi was a member of the "Dixie Mission" to Yenan, the HQ of the Chinese communist forces in the 1940s. 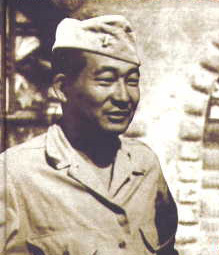 Ariyoshi spent nearly two years in China as an officer of an all-Nisei psychological warfare unit. The unit's job was to direct propaganda against the Japanese civilians and troops in China at the time. Immediately after the war, Koji Ariyoshi worked in China and then New York City with accused "Amerasia" spy John S. Service and Ed Rohrbough -- who would become business manager of the Honolulu Record -- in an effort to steer U.S. policy towards the Communists and against the Nationalists. Rohrbough had edited a U.S. Office of War Information newspaper in Fukien, China during the war. Ariyoshi also worked with Maud Russell in the Committee for a Democratic Far Eastern Policy. Back in Hawaii after the war, Ariyoshi established and edited his own po-labor newspaper, the Honolulu Record and helped to write for and edit Ti Mangyuna, with Rev.Emilio Yadao. In 1951, with John Reinecke and Aiko Reinecke, Jack Hall of the ILWU, and others Ariyoshi was arrested under the Smith Act for his activities with the Communist Party USA. Ariyoshi was a leader in the establishment of the US-China Peoples Friendship Association and a founder of the Hawaii branch. In 1972, Ariyoshi, then president of China Products, Inc. in Hawaii, traveled to China for 35 days. He met Chou En-lai "he remembered me, we had a a pleasant conversation about the 'old days' ". This page was last modified on 11 July 2015, at 23:29.